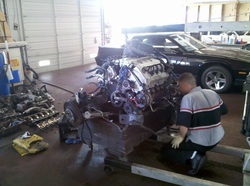 Our shop has repaired several Cadillac Northstar engines that had blown head gaskets due to thread failure in the block. The common fix at the dealer level has been to install new threads (time serts) which are replacement threads twisted into the block. These tend to work for a while, but fail over time. 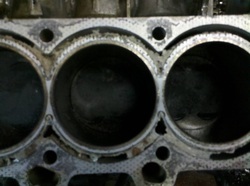 The last 4 engines we repaired were already repaired with time serts at local dealers. 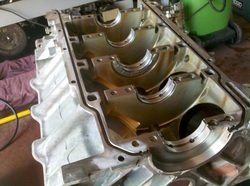 With the help of Carrolls Custom Cadillac in Texas, we are machining the block with much larger threads and installing studs, similar to most race car applications, and scrapping old head bolt design which has caused the problems in the first place. The cost to make this repair is much less than the dealer would charge and is guaranteed longer. It is possible to repair your vehicle once and for all and have it not break the bank. 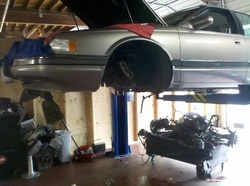 I have some pictures here of the vehicle we are currently working on. 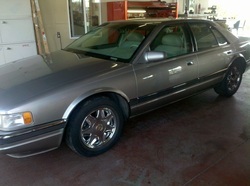 It is a 1997 Seville SLS. We opted to replace rod and main bearings due to extreme wear. This is a bit uncommon. If you have any questions about this process, you can call us at 916-773-3390 or send us a quick contact to the left. Up on the hoist, ready to go. Entire sub-frame assm with engine and transmission dropped out from under vehicle. It is set on a roll-around cradle so that it can be moved around shop. 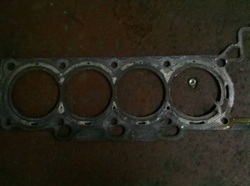 Blown head gasket. You can see a lot of pour in gasket fixer stuff in all the coolant jackets of this gasket. This didn’t work and caused worse coolant flow. Check out the coolant jackets on this block. The pour in solution restricted the flow of coolant by at least 50%. Took forever to clean it all out. 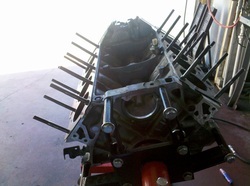 Studs installed in engine block. 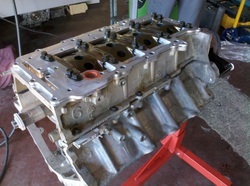 Heads are ready to be reinstalled. New main bearings. Rod bearings were also replaced. This is the bottom side of the engine with the block half freshly installed with new sealant. Oil pan is next. 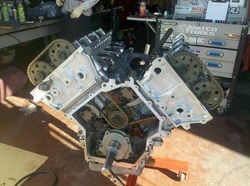 Picture of the front of the engine after heads and lower end are installed. Notice 3 timing chains. Very critical set-up. Getting ready to install front timing cover.